Albertsons and Riteaid called off merger. Riteaid investers voted. Down merger. And for some reason my mother would never ever under any circumstances let us get a triple scoop. That's the ONLY thing I would get! 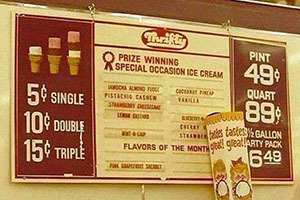 The triple scoop was up to 25 cents when I was a kid. And this after they sold off a bunch of stores to Walgreens? Sounds like a rite royal mess.